The storefront in Beverly Hills. On a recent Saturday it was buzzing with people, including one Millennial who spent about thirty minutes dancing by herself and bragging about her Snapchat followers to anyone who would listen. Ordering your concoction is a multi-tiered affair. Patrons first select a base (ie. 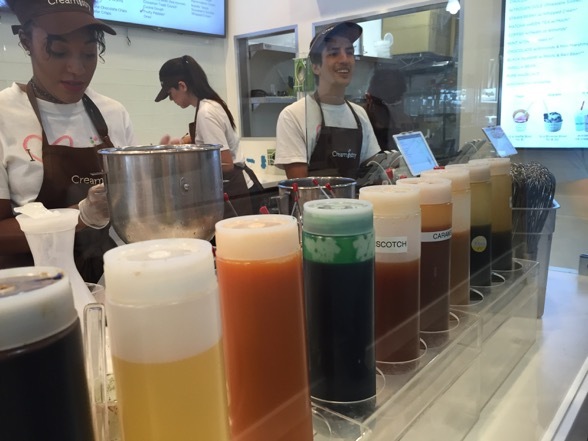 Premium cream madness, less premium organic madness, sorbet, or coconut milk). Then it’s on to flavors: chocolate, vanilla, and about thirty more beyond that. 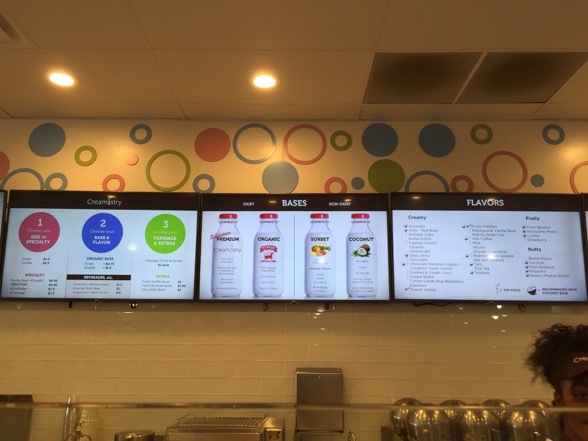 In addition to flavors, there are also toppings, mix-ins, and a whole smorgasbord of calorie bombs to be added to your creation. Then the magic happens. The ice cream artists (I’ve named them that) put everything into one of these custom machines and then the mixing commences. 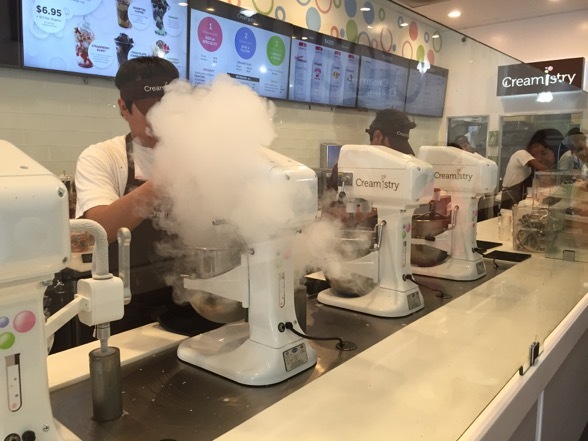 Spurts of liquid nitrogen cause clouds to emerge from the stand-mixers. It’s rather dramatic. Soon the entire parlor is filled with foggy goodness. It’s a big hit with the kids. 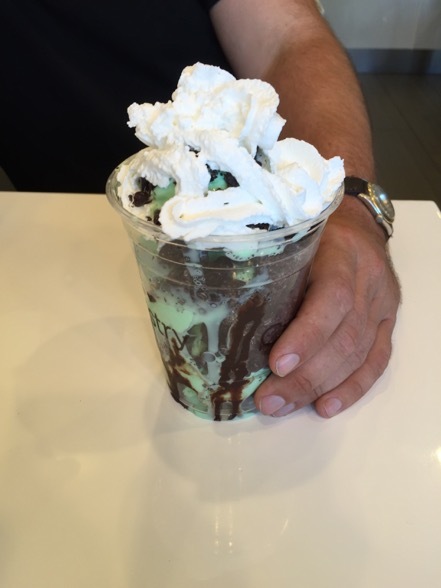 My friend Case gets a pre-made combo that involves mint and fudge and perhaps even Oreos. I don’t remember exactly. It’s well-received. 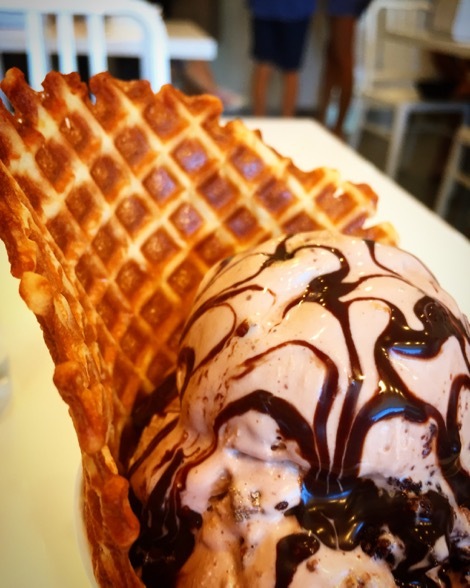 As for me, I go for broke: Nutella ice cream with peanut-butter cups and brownie bits mixed in, topped with fudge, and placed in a waffle bowl. The final result is very good. The ice cream has a unique texture — almost like a firm soft-serve, if that even makes sense. 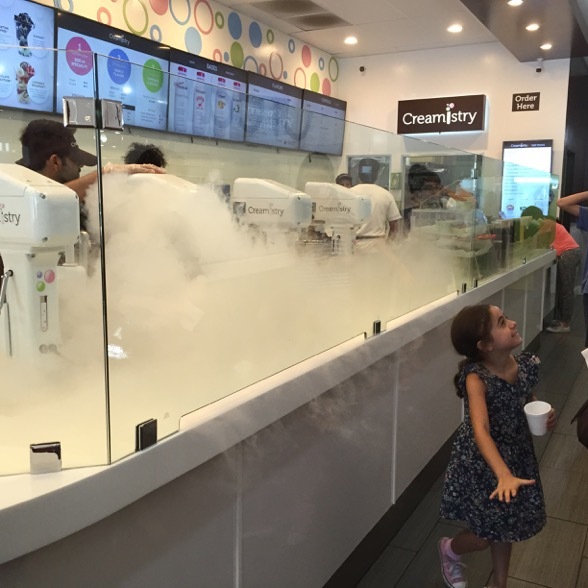 Or perhaps frozen custard. Either way, it’s a gut-buster (although, that doesn’t stop me from eating every last bite of my concoction). Later, I try a pre-made coffee ice cream thing with just a regular base (not the premium one), and it’s just as rich. This is not for the faint of heart. And now the downside: my crazy concoction would have cost $10 and change had I not been treated to a media-comped experience. That’s a bit pricey for ice cream. 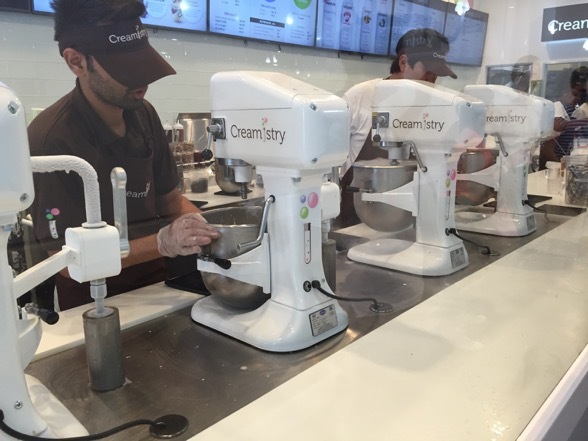 Admittedly, I went a bit HAM with my toppings, etc., but even at its most basic, Creamistry will cost you $6 or $7. Now, the good news is that the servings are very large, even for a small, but those prices could prove to be prohibitive for some. Nevertheless, I’ve had liquid nitrogen ice creams several times in the past, and I’ve always been left a bit COLD (rimshot!). 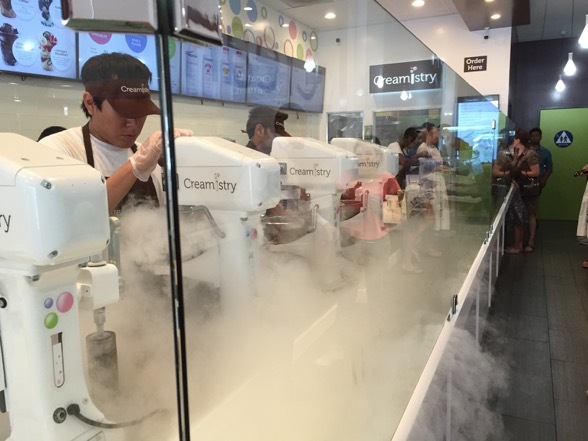 Creamistry is by far the best i’ve had, and it’s certainly way better than Coldstone (if we want to compare customizable ice cream experiences). Still not sure if it’s your thing? Well, good news. 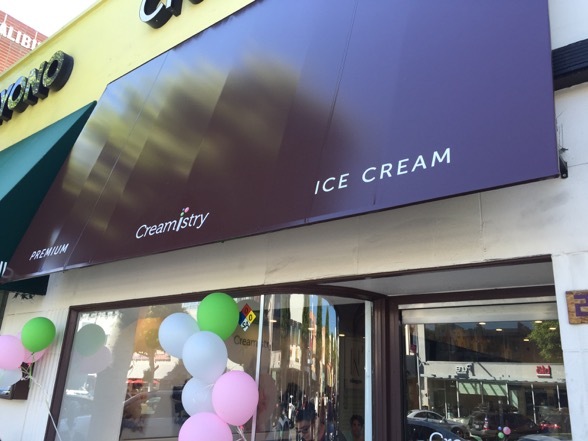 Creamistry is offering FREE ICE CREAM (woop woop!) in October at certain locations. Check out their website and Twitter for more information. 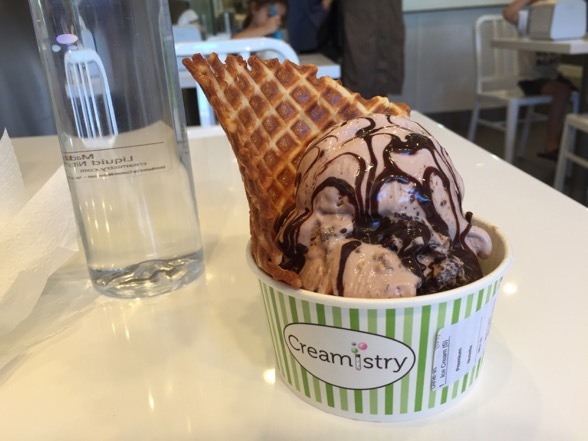 This entry was posted in Food and tagged Creamistry, food, ice cream by Ben Mandelker. Bookmark the permalink.